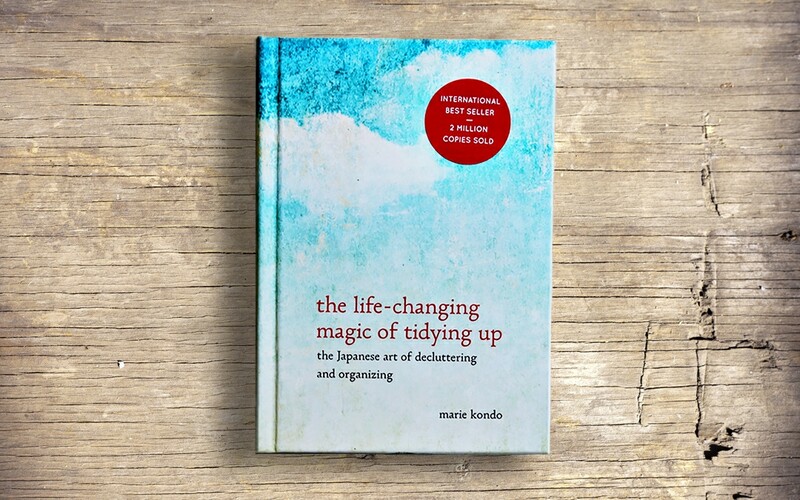 For months I had been hearing about this little book, The Life-Changing Magic of Tidying Up: the Japanese Art of Decluttering and Organizing, by Marie Kondo. How could I avoid it? The book was ubiquitous, a number-one New York Times bestseller that people seemed to regard with an almost religious devotion. With “magic” and “life-changing” in the title, it didn’t sound like a book on organizing; it didn’t even look like one, with its small, elegant typeface and cover image of soft clouds. And when I finally overcame my resistance—for tidy is not the first word people use to describe me, and I worried that the book would ask things of me I couldn’t possibly do—I found that Kondo didn’t write like your average organizational expert either. In fact, she wrote more like a mystic whose interest happened to be organization. As I went deeper in the book, I was struck by her language and her unique view on the relationship between people and the things with which they surround themselves. “Choose those things that spark joy when you touch them,” and “At their core, the things we really like do not change over time,” she writes. Words like organization and efficiency have never done much for me; but words like joy and love—well, if tidying my house could really bring more joy and love, I decided, I was up for the task. “In my method,” Kendo says, “your feelings are the standard for decision making.” Well, I may be short on organizational skills, but I have plenty of feelings; maybe I could make this tidying business work after all. Now, in spite of Kondo’s assertion that we must first discard everything unnecessary “intensely and completely,” I knew up front that there were certain suggestions I just wasn’t going to be able to follow. I wasn’t going to take every book off the shelf and regard its cover to decide if it sparked joy; I wasn’t going to take every single photo out of its photo album; and I certainly wasn’t going to end up with a closet of clothes arranged from dark to light and long to short. Still, I loved the idea that getting rid of unnecessary stuff could bring me more joy and a new relationship with the items I truly treasure. So I decided to focus my efforts on a few key areas where I had struggled to maintain any semblance of order since moving into my home a year ago—my kitchen, my home office and my basement workshop. At first I was filled with dread at the thought of the drudgery awaiting me. But it didn’t take long for that to change. I put on some upbeat music and dove into the kitchen first. After getting rid of old boxes of open pasta, past-date baking mixes and all but one of my seven unopened cans of garbanzo beans, I noticed I was smiling. What’s more, now I could actually find the things I did use without all the useless stuff in the way. Now my junk drawer needed a new name—it wasn’t full of junk, but a carefully curated selection of batteries, pens, scissors and other necessities that I could take in at a glance without digging. Heartened by this first taste of success, I began to repeat Kondo’s nuggets of wisdom like mantras as I moved on to my office: Your living space wants to help you. Appreciate your possessions and gain strong allies. Follow your intuition and all will be well. This time, I took Kondo’s advice to heart and removed everything from my desk, then began sorting and discarding. I quickly noticed two categories of stuff in my office shelves and cabinets—stuff that accrued simply because I didn’t have a system for discarding it, like old bills and random papers, and stuff that I’d horded because it seemed too important to discard. The first category was easy; throw it all away! The second category was trickier, including years’ worth of letters, drawings, jottings, objects that had once seemed precious (though I had since forgotten their provenance completely). When I finished, not only was my desk clean, but I felt lighter inside. The things that were left were the things that mattered. My space was open, clear, calm, inviting. I made a cup of tea and surveyed my results with satisfaction. But I didn’t rest long; more rooms were waiting, more piles of stuff I don’t want to cart around anymore, more useless junk that fails to bring me joy.